This has been an incredibly hectic week. We had the selection meeting for the Winter issue of Cast On. The stitch pattern focus is on brioche and the fashion framework is for cowls. The issue will be accessory heavy as it is the holiday issue...lots of ideas for gifts. I hauled up all of the yarn I have put into center-pull balls and the yarn for the goody bags. This photo is just the tip of the iceberg. My car was stuffed. The sponsors for the yarn tasting are providing AT LEAST 20 skeins which will be distributed among the bags but Anzula and Baah sent 80, one for each participant. I envision sort of a Halloween Candy Exchange after the tasting. I indicated in a post on Ravelry that I would provide a complete list of the sponsors but that would take too much time. Instead I took two photographs of the swatches I have worked up and tagged. These are the yarns that are finished....I still have four yarns from Blue Moon, three from LB Collection, Swan Island, Imperial Yarn, Brown Sheep, Araucania, and Elemental Affects to "process". There are still a few companies who want to be sponsors but haven't sent the yarn yet. 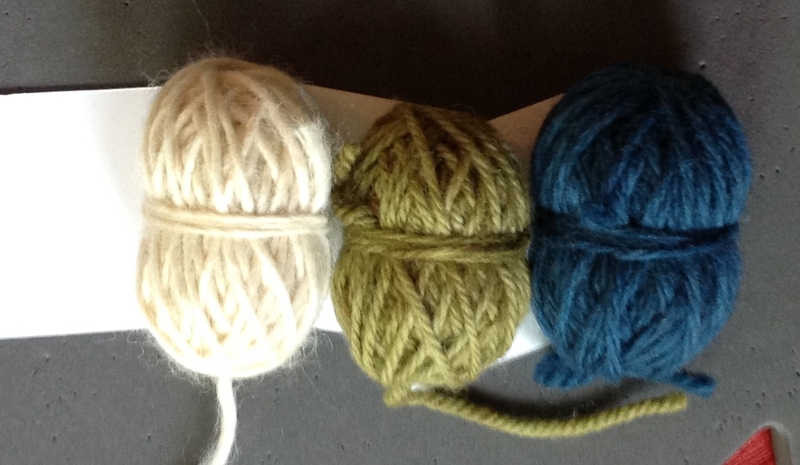 There are three weights: lace/sock, DK and worsted. As of this minute there are 32 yarns. On Tuesday we had the photo shoot for the Fall issue at an alpaca farm. It was a lovely location. After a late start it went quite well. We had a baby and his big brother model the argyle vests I did a million years ago. They were absolutely adorable. I changed what I plan to do for winter so we can use them again. It seemed like I reviewed a ton of lessons this week but that is probably because I was out of town. Keep up the good work! Salon will be on Sunday from 1:30-3:20 pm. I finished up the front (or back) of my Wasp Wing dress but as soon as yarn starts arriving for the garments I have signed on to do I will have to put it aside. I was hoping to finish it before the conference at the end of July but I don't think that will happen. It will look SO different when it is blocked. It is the same as the tunic I did for the fall issue but longer. I had a lovely week out west. I took the photo above along the Colorado River outside Moab where we had a picnic. It was nice vising my old haunts. I came home to BOXES and BOXES of yarn for the Yarn Tasting. Some of the sponsors have been incredibly generous sending not only 4 or 5 different yarns to taste but absolutely fabulous yarns for the goody bags. Anzula sent 80 skeins...enough for every participants. It does take quite a bit of time to get the yarns ready. I am particularly enjoying knitting up the swatches. It has been very informative. Some of the designs I have proposed for the winter issue will use yarn I have "tasted." Here are a few of them blocking. I have four more soaking right now. Only one lesson arrived while I was out of town but several arrived during the past week. All of the work has been just lovely. Thank you for all of your hard work! This topic is a special request. I have a new student who wanted to know how to back up to fix mistakes or how to take out work completely. If you notice a mistake only a few stitches away it is easy to "unknit". Just insert the left needle into the stitch below the one you just knit slip it to the left needle and pull the working yarn out. Continue to do this until you reach the stitch you need to fix. When you "unknit" you avoid one of the pitfall of ripping work out. It is easy to change the mount of the stitch on the needle and unless you are paying attention, the resulting stitch might become twisted. When you rip work out, you remove the needle and pull on the working yarn until you reach the location you need to fix. I always put a safety pin at the location first so I don't get carried away. This works fine with yarns that have some "memory," like worsted wool. You just put the stitches back on the needle. When you do this, try to put the stitches back on through the back. It will make things easier. It isn't the end of the world if you can't. The goal is first to get the stitches back on the needle without splitting the yarn. If you rip out stitches worked in fibers like bamboo, the stitches sometimes collapse. Lifelines (which I will discuss next week) are the answer for those types of fibers. Many times the stitches will not be mounted properly on the needle. This photo shows three stitches which are not properly mounted. If you were to knit or purl these stitches through the front, you will twist the stitches. You can see in the photograph below that twisted stitches stand out. Salon will be on Saturday from 2-4pm. It will take some effort on my part to clear a path to the dining room! I am not kidding when I say I have boxes of yarn everywhere. I finished up the last of the socks as this rather impressionistic photograph suggests. I really like this stitch pattern. I started on my wasp wing tunic. It will be wider at the bottom and longer than the one I did for Cast On. The yarn is the Shibui Linen and is actually gray in color. It looks tan here.